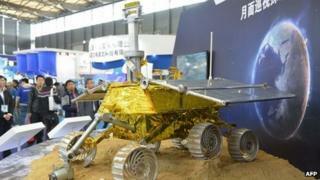 Chinese officials say they intend to land the country's first unmanned probe on the Moon next month. The probe has been named Yutu or "Jade Rabbit", after the character that Chinese folklore says lives on the Moon's surface. In 2007, the country despatched an unmanned spacecraft called Chang'e to orbit the Moon. The craft stayed in space for 16 months before being intentionally crashed on to the Moon's surface. A specific date for the latest launch, first announced in August, has not been given but officials said on Tuesday that it would happen in early December. If all goes according to plan, the lunar probe will land on the Moon sometime in the middle of the month. A landing vehicle will carry the rover, which will explore an area called the Bay of Rainbows, surveying the surface over three months.